The steel and glass towers of Calgary's business district pierce the clear western sky. The red topped Calgary Tower once dominated the skyline until the construction boom of the 1980's. Painted by Alberta Artist Marilyn Kinsella, this view is from McHugh Bluff (which is named for a family of Calgary pioneers). 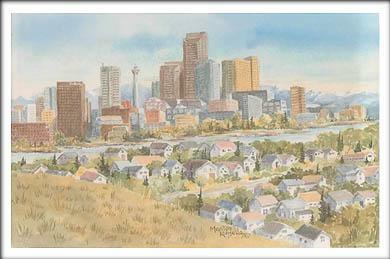 It illustrates the residential area of Hillhurst and the city skyline with the Bow River and distant Canadian Rockies.